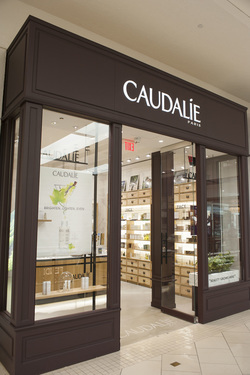 Caudalie, the French Vinotherapie skincare line opened its first boutique spa in Florida at Aventura Mall! The Aventura Mall is Miami’s premier shopping destination. With more than 28 million visitors per year, Aventura Mall’s local and international shoppers will find the perfect marriage of luxury, eco-friendly, and sun protective beauty products at Caudalie Spa. Designed by Mathilde and Bertrand Thomas, founders of Caudalie the new spa is 650 Square feet of luxury. The spa includes one treatment room for facials, massages & body scrubs. Cocoon Wrap to exfoliate and rejuvenate the skin. Oxygen serum treatment will be offered to target delivery of active ingredients for instantly visible results. Besides luxurious treatments, the spa also features Caudalie’s state-of-the-art serums, moisturizers, cleansers, toners, exfoliators and the line’s cult favorite, the Beauty Elixir. ABOUT CAUDALIE: Caudalie is a 100% independent, family-run company created by Mathilde and Bertrand Thomas in 1995. Twenty years ago, the couple discovered the amazing antioxidant powers of grape and grapevine Polyphenols during the harvest on their family vineyard of Château Smith Haut Lafitte, and has since created the Vinotherapie skincare line that is carried around the world and in their 9 Vinotherapie Spas. As a member of the “1% for the Planet,” Caudalie commits to giving back one percent of its global turnover to associations for the protection of the environment.